The Pfister PermaBalance demonstrates Pfister dedication to technology. 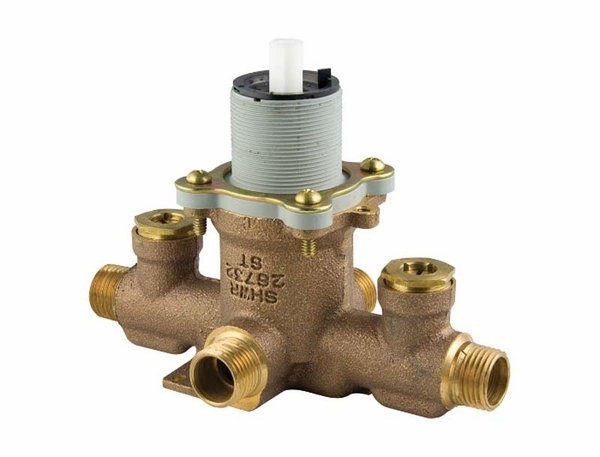 This valve demonstrates a large jump forward in tub and shower valve technology. It includes a brass stem and has a flexible install depth, for shallow wall installations. The high precision spool balancing unit, PermaBalance, combines the best of in-wall valve technology with your home. It offers years of trouble free service with the Pfister Pforever Warranty, while still being able to pressure balance down to flow rates as low as 0.5 gallons per minute from the shower head. This Pfister Permabalance Single Handle Shower Valve with Stops is ADA compliant, comes with step-by-step installation instructions and includes a plug for a shower only option. What is the difference between the 340A and the 310A? Which is the best? The 340A is a Single Handle Tub and Shower Valve, while the 310A is a shower valve only.